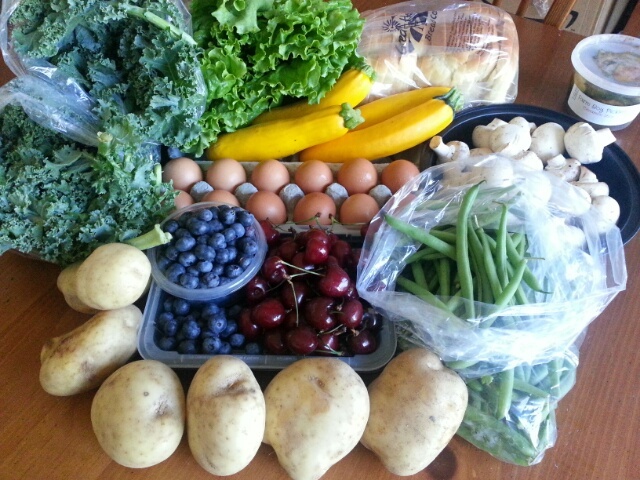 We have kale, green leaf lettuce, yellow zucchini, mushrooms, green beans, white potatoes, sweet cherries, blueberries, eggs, and bread (Great Harvest challah). I like yellow zucchini much better than yellow squash, because squash that doesn’t change diameter as you go is just a lot easier to deal with on the cutting board. That way you don’t have to work too hard to cut everything the same size for even cooking. It’s the little things. 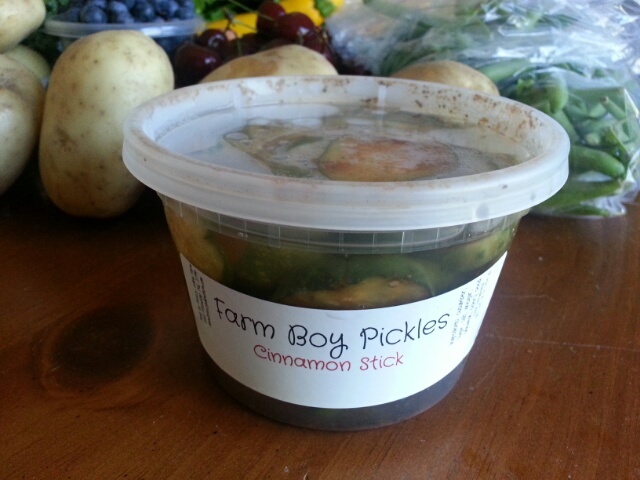 It’s a sweet pickle with a bit of cinnamon kick – basically a bread and butter pickle with a little touch of spice. I was dubious at first about the concept, but when I tried a sample, I was hooked. I’ve been eating a couple of bites after dinner in place of dessert. I love it. Every fourth week of the CSA brings a special bonus item, and for this week 4, we got to choose between Breezy Willow’s barbecue sauce and their horseradish mustard. I went for the mustard. 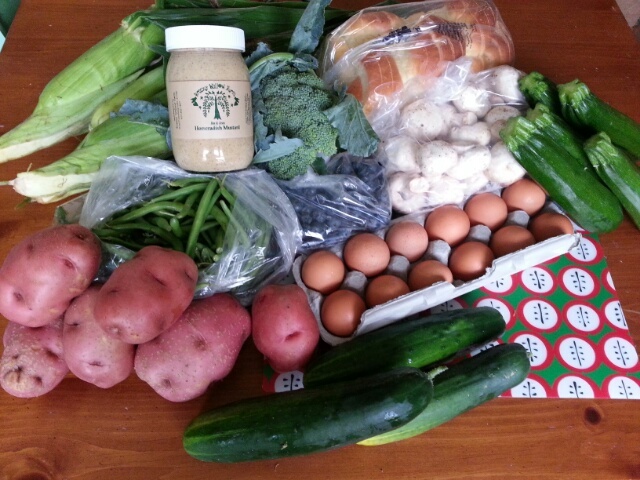 The rest of the pickup consisted of corn, broccoli, green beans, red potatoes, mushrooms, zucchini, cucumbers, eggs, and bread (Great Harvest challah again; I know what I like). It’s the beginning of what will likely be a giant corn avalanche this summer. We always get a ton of corn in this CSA. My family loves corn in all forms – boiled, grilled, cut off the cob and creamed – so it’s no hardship at all. Before the Little Prince was born, I used to blanch and freeze the corn for use in winter. Now, though, he eats it up as fast as I can prepare it.